Born in Traverse City, MI, and a 2003 graduate of Kingsley High School, Sergeant Justin Hansen enlisted in the Marine Corps in June 2005. He was captain of his high school’s track team and wrestling team and earned a brown belt in the Marine Corps Martial Arts Program. Sgt. 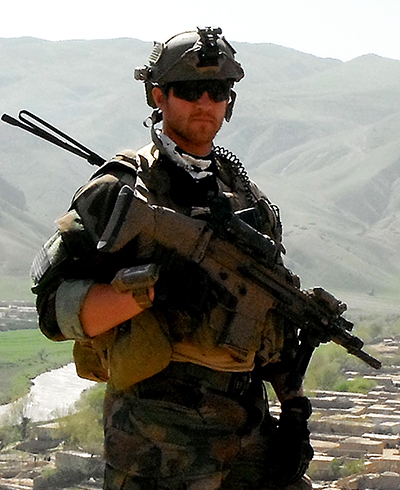 Hansen began his career as a Reconnaissance Marine, assigned to 3rd Recon Battalion, Okinawa, Japan, and came to MARSOC in April 2009, becoming a Critical Skills Operator in 2010. He was assigned to Hotel Company, 2nd Marine Special Operations Battalion, Camp Lejeune, in Dec. 2010. Sgt. Hansen’s deployment with H Co., 2nd MSOB to Badghis Province in Afghanistan in support of Operation Enduring Freedom was his first deployment. While on deployment, Sgt. Hansen was on patrol as part of a cordon and search operation in search of a high value target when the team was hit with small arms fire. Sgt. Hansen died in the firefight. Sgt. Hansen’s personal decorations include the Bronze Star awarded posthumously in 2012, Purple Heart, two Combat Action Ribbons and two Good Conduct Medals.